With all the preparation surrounding a cloud migration, cyber security is sometimes left on the backburner. That’s when a data breach can take place. 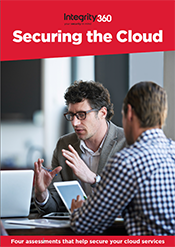 Businesses can develop a comprehensive, security-driven cloud computing strategy that preserves business continuity and reduces the likelihood of a data breach taking place with the help of experienced cloud security specialists. Find out how to secure your company’s cloud services by filling out the form below. © Copyright Integrity360 2016. All Rights Reserved.